Typical conversations about company values and mission statements aren’t exactly thrilling. People often glaze over when hearing business speak and jargon. We hate that, too, which is why we aim for real talk instead. That’s why the foundation of everything we do and believe in is supported by our Five Columns: Do Good Work, Value Our Partners, Be Good to Each Other, Be Humble and Experiment Often. More than just ambitious principles to live and work by, these are the basis of Column Five’s genetic makeup—living on our walls as a visual reminder and keeping us in check. In this last installment of our Five Columns series, we examine our fifth column: Experiment Often. We’re pretty proud of our C5 creative team, having carefully cultivated a group of inventive minds in both our California and NYC offices. Seeing skillful and imaginative projects come to fruition excites us for future work. Still, we know it’s all too easy to go on creative autopilot—and that is dangerous. Complacency kills creativity, but experimentation nurtures it. So, we push ourselves to experiment, test, tweak, and fail in the pursuit of something better (even if that means failing spectacularly at times). Failure, especially at work, is terrifying. No one likes to look bad in front of a boss or, worse, a partner. But without risk, there is little reward. Trying new things, no matter the result, is what makes us grow as a business and as people. 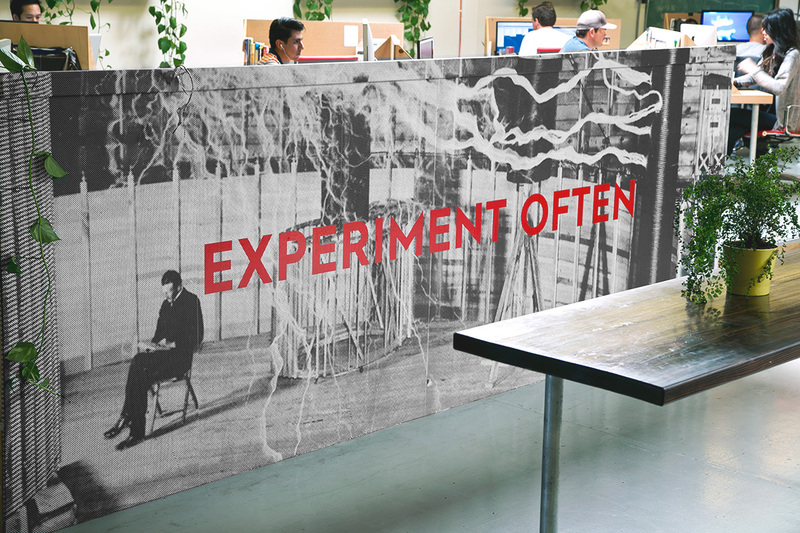 Experimentation is our inspiration. It’s how we pick up new skills and hack tough problems to deliver the best, most innovative work possible. Whether we’re building a Rube Goldberg machine or creating badass propaganda posters for a film campaign, we’re always aiming to improve what we do. In addition to the work we create with our partners, we use every chance we can to flex our creative muscles—just because. An Arrested Developmentquote generator? Let’s do it. A guide to seasonal fruits and veggies? Totally necessary. A GIF for National Dollar Day? It’s all about the Benjamins, baby. Although not every project is a slam dunk (some never see the light of day), we are committed to taking creative leaps to see where we land. While we love to experiment on our own projects, we relish any opportunity to collaborate on new ideas with our partners—it’s how we keep the spark alive. Taking on a variety of projects with partners across a wide range of industries excites us, and we’re always eager to find new solutions to visual communication challenges. We offer—and ask for—any ideas (no matter how outlandish) that can help achieve a project’s goals. Whether working with new partners or long-time collaborators, we nurture relationships that let us both grow and innovate. Our creative work is only one part of our company. There’s still payroll, processes, and a million other things that we can always do better. We know that, as part of this ongoing experimental work ethic, we must remain willing to learn and experiment with our own processes to grow and become more dynamic. So, we work to experiment with new solutions to our problems—and share them with the team. (We even shut down shop once a quarter to have a Hack Day, during which the entire company collaborates to solve problems.) By being open to experimentation, we learn how to do everything better—from short-cutting email, to brewing coffee, to delivering a better project to a partner. Thinking you have it all figured out is a great way to limit yourself. We aim, instead, to keep tinkering and keep trying. And when something works, with our partners and our team, we all get to share the success.